When I was in the third grade, all I wanted for my ninth birthday was a copy of Ghidorah: The Three-Headed Monster. Why this film in particular held such fascination for me, I couldn't say for certain. I suspect that two factors spurred my desire: the majestic still of a rampaging Ghidorah (or Ghidrah as it's sometimes spelled) in William K. Everson's Classics of the Horror Film and an entry in Leonard Maltin's 1988 Movie Guide that informed interested readers that the flick featured four monsters, including the legendary Godzilla, for the price of one. What boy could pass that up? When I finally received my cherished VHS tape, I was not disappointed. It had monsters and they fought each other (and the human stuff was okay to pass the time between monster appearances). Watching Ghidorah today, I feel like I'm sitting with that kid right next to me, the seventeen years of distance reduced to the length of my couch. The story is a little more tangled than your average giant monster yarn, but let's see if we can unravel it. During an unprecedented January heat wave, a meteorite crashes to Earth. A team of scientists investigate the object and discover it exhibits strange properties. Meanwhile, a woman (who's a dead ringer for a believed-assassinated princess) begins making public pronouncements about the return of Godzilla and the pterodactyl-like Rodan. What's more, this woman says she's a Martian!1 Godzilla and Rodan do, in fact, show up and start brawling with each other. 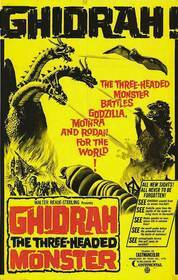 Then Ghidorah, a dragon-like monster with three heads, hatches from the meteorite and wreaks havoc on Japan. Mothra quickly arrives to help the humans, but without help from the obstinate Godzilla and Rodan, the Earth is doomed! Ghidorah marks the beginning of Godzilla's evolution from a rampaging menace to a lovable defender of humankind. Not only does the big guy help drive off the title monster, but he also keeps most of his destructive antics away from major metropolitan areas. Up until the final fight, in fact, he mainly acts as a comic sparring partner for Rodan (who also gets a more comedy friendly makeover, in strong contrast to his appearance in the more serious-minded Rodan, the Flying Monster). The debate over the merits of the family-oriented direction of the Godzilla character is outside of the scope of this review; I can only really judge how the potrayal of Godzilla affects the movie. Given those parameters, it's mostly a success. Suit actor Haruo Nakajima plays to the cheap seats, using his body language to mug comedically in a way that's endearing 80% of the time and just this side of annoying for the rest. It's probably lucky that the monster action in Ghidorah is reduced compared to previous films in the series, or that balance might have shifted more negatively. More to the interest of my eight-year-old self, however, is the title character. Sporting three heads, two tails, and a massive wingspan, Ghidorah is any kid's dream. You can keep Godzilla and his atomic breath. Ghidorah can fire lightning bolts from all three mouths! The suit design, all gold scales and dragon influences, has a certain mythic quality, despite the monster being an alien from outer space.2 It may very well be that the conflict between Ghidorah's fantasy-inspired appearance and his sci-fi origins may play a large part in his appeal. It's hard to say for certain - opinions formed at age eight tend to resist analysis. 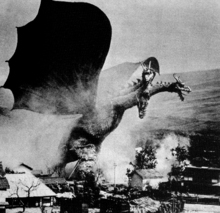 I just think Ghidorah is cool as hell. My tastes have changed in the past seventeen years. I don't love Tim Burton's Batman anymore. I'd rather not eat Kraft Macaroni and Cheese all day every day. "Weird" Al Yankovic is no longer my favorite musical artist of all time. However, put me down in front of the right giant monster movie and I'm still a gleeful fan, cheering on those men in monster suits as they destroy Tokyo and wrestle each other. There's a magic in these movie that no amount of critical distance can fully dim. And that's the way it should be. Also, The Oregon Trail still rules. 1. 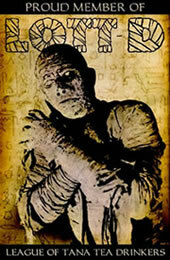 I'm reviewing the English-language version of the movie, technically titled Ghidrah, the Three-Headed Monster. In the Japanese version, the princess claims to be from Venus. 2. In 2001's Giant Monsters All-Out Attack, director Shusuke Kaneko would give Ghidorah his only turn as a hero by positing him as a creature of legend, a mythical monster tasked to defend Japan. 3. As David Kalat points out in his Ghidorah commentary, the American edit actually fixes many of the continuity errors in the original Japanese cut, although it also introduces a few of its own. Submitted by Boyd (not verified) on Tue, 2010-02-02 23:25. This movie right here Ghidorah The Three Headed monster I have to put it on my top ten list of all time favorite movies in general. I'm 26 about to be 27 and I still watch Godzilla movies so you could say this about me I'm a big kid at heart. Most movies today you just don't find this kind of creativity. The special effects were good for the time it was made. Better than Godzilla vs Gigan don't get me wrong Gigan's a cool character but I like him better in Godzilla vs Megalon. Anyway back to the point best movie Ghidorah was featured in plus Godzilla, Rodan and Mothra were awesome in this film.